Beach: Mayo Beach 1 mi. Indian Neck Beach 2 mi. New construction on 1 1/2 wooded acres, 4500 sq. ft. upside-down house on a dead end cul-de-sac road with private access to the Bay. There is a 420 sq.ft. top floor deck as well as 2 lower decks and a private balcony off the upstairs master suite, granite and marble counters throughout, new stainless appliances in a fully equipped dream kitchen, open floor plan with fireplace, ceiling fans in every room, central air conditioning, wifi throughout and state of the art electronics... an outdoor shower, gas grill, paved driveway with basketball court, and a sand volleyball court. A lovely 15-minute walk along the water to Uncle Tim's Bridge brings you into town, where you'll find the harbor, galleries, shopping and restaurants, public tennis and basketball courts and bay beaches. A couple of miles by bike or car brings you to the Atlantic Ocean beaches. The Cape Cod National Seashore, which protects some 60% of the land in Wellfleet, as well as the Audubon Society are headquartered in this quaint and picturesque area, famous for its fresh shellfish. The 25-mile Cape Cod Rail Trail is accessible at LeCount Hollow Road in Wellfleet about 2 miles from the house, and local bike rentals are available within walking distance from the house during the summer. Also just a short drive brings you to Great Island National Park for truly enjoyable & scenic hiking and pristine beaches. Nearest beach: Mayo Beach 1 mi. Indian Neck Beach 2 mi. 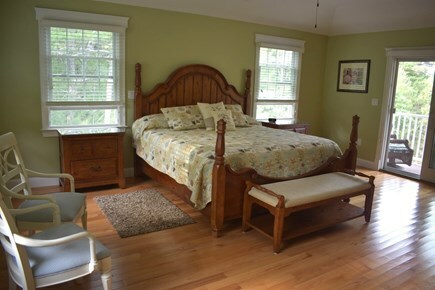 Additional pricing info: Oyster Festival Weekend $800/nt with a minimum of 3 nights... walk to town!, State and local taxes of 12.45% will apply. This house has everything - perfect! Our extended family has been renting this house for over 3 years, and each year it just gets better! The house truly has everything indoor and out. 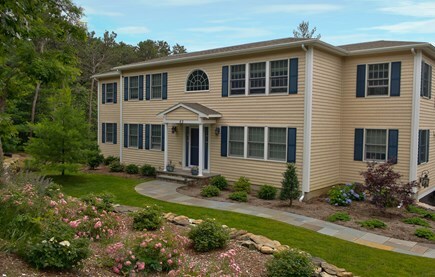 It is not only spacious, and beautifully appointed, with gorgeous landscaping, but is extremely well-kept by the owners. 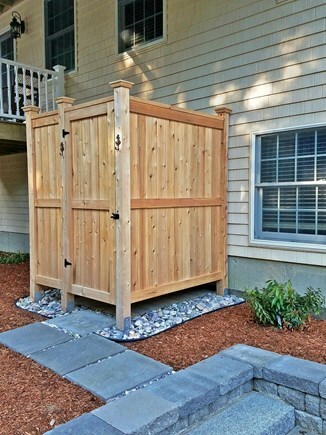 Each year we find another wonderful addition to the property -- a new outdoor shower, finished lower level, kitchen supplies, etc. The owners seem to take great pride in their property, want to share their home and truly want their guests to feel welcomed and comfortable. The house is very well equipped - well stocked, organized kitchen (great sharp knives! ), comfortable, ample seating inside and out, and extra fridge in basement. 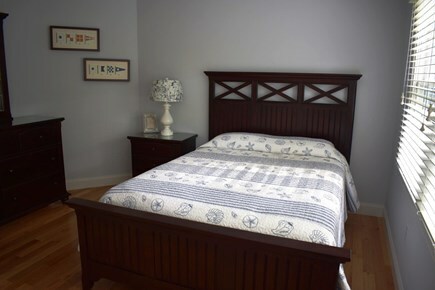 The owners also solicit suggestions from their guests and follow-up on these suggestions, all with the hope to make a guest's stay more perfect, more comfortable. 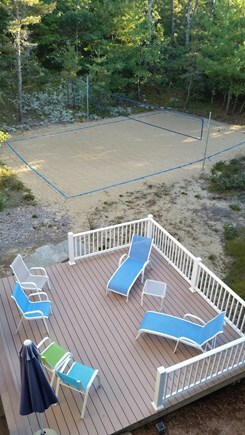 One of our favorite things about this home is the sand volleyball court -- how many houses on the Cape have this to offer!? Another thing we love is the location -- easy access by car or foot to town, close to ponds and beaches, quiet neighborhood. Our family has been renting homes in Wellfleet for 14 years, have enjoyed some other homes, but couldn't find the perfect one for our extended family UNTIL we found this property! Thanks so much for sharing your perfect home with us! Our family rented Holly & Steve's gorgeous Wellfleet home for the second year in a row. It was just as beautiful as we remembered! The house is stunning from top to bottom, with every amenity one could imagine. The rooms are all beautifully furnished, and the kitchen is an absolute dream! It is truly the perfect home in an ideal location. We look forward to returning next year! We had another wonderful stay in this beautiful house. We had a sisters week with long walks, good food and fun times. I'm already looking forward to coming back again. This home is very well taken care of and equipped with most everything you could need. It rates 5 stars in my book! The geographical location of this property is very good. It is just off the main arterial road through the Cape and within walking distance on the beach to Wellfleet which is lovely. The house is very privately surrounded by trees which offer an adventure playground for children and the beach is 5 minutes walk away. Other outside activities for children are a volleyball court and a basketball net and for adults there are 2 outside dining areas - one leading off the kitchen which is perfect access and one below. The master bedrooms have access to private balconies! The house itself is thoughfully designed over 3 floors. The base is a large area with a table tennis table for active children on rainy days. The next level up houses an indoor area for children or other parts of a family, bedrooms including a master bedroom, a bathroom and the laundry facilities. At the top there is another master bedroom, another bath room and the kitchen, lounge and dining area. 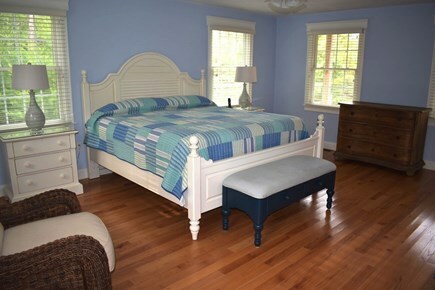 Each master bedroom has its own ensuite bathroom. 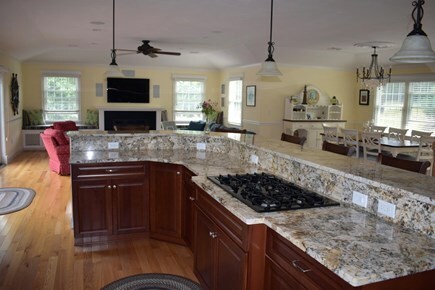 The kitchen is beautiful as shown in the photos. It is large enough to cook for many people but is not overwhelming. This leads to a beautiful lounge area which, although seating probably 8 people, is so cosily designed that you don't want to leave! Two rotating tilting chairs are part of this seating arrangement and SO comfortable. 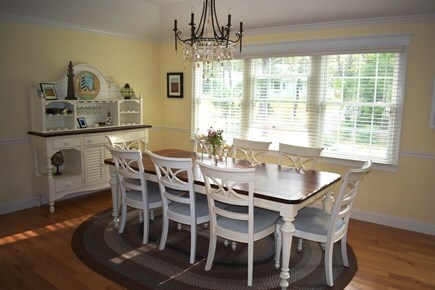 To the side of these areas is a well-presented dining area with a lovely table and chairs. The quality of all the bathrooms is extremely high with wet rooms and very luxurious fittings. Each is worthy of 5-star rating in itself. 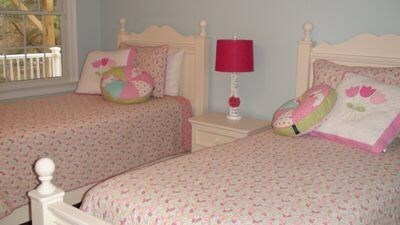 The bedrooms are furnished beautifully and the beds themselves are very, very comfortable. The kitchen is better stocked than mine! You are left wanting for nothing. It is a joy to cook there. The whole house was immaculately clean - including soft furnishings, windows, contents of kitchen drawers and cupboards. It felt as if everything was very new, but it was simply very, very spotless. I would recommend this property to anyone. It is wonderful from any point of view and worked for us on levels of comfort, cosiness, welcome, amenities and luxury. My husband and I spent a week in early November at Holly and Steve's gorgeous well-built home in Wellfleet, Ma. This home is huge with multiple bathrooms and bedrooms to accommodate from a small to a large group. This kitchen is the most well stocked kitchen we have ever seen. You can take a wonderful walk down Richman Lane and watch sunsets or walk into town. The house is so well located. We spent the week with adventures going to Marconi Beach, Wellfleet Bay Wildlife Sanctuary, Salt Pond and multiple Wellfleet beaches. You will love the house. It is nestled in beautiful landscape. We spent a peaceful and enjoyable week. The house is also close to Provincetown which was an added bonus ! The house exceeded our expectations. The house was very clean, well stocked, and in very good condition. The bonus was that the house was walking distance to downtown. Nice open floor plan with many rooms to escape to - very spacious house. The owners were very helpful and were in contact with us during our stay. I can't say enough good things about this house and its owners. When Holly said the kitchen was well-stocked, she wasn't kidding! It had everything we needed to cook, hang out and enjoy ourselves. The only "issue" we had was how fast the week went. We didn't want to leave and hope to be back next year. Thank you Holly/Steve for opening up your wonderful home to us. My extended family had a wonderful week in this big, beautiful house. It's been very recently updated and tastefully done. Great downstairs and outdoor spaces for the kids. It's also in one of our favorite little neighborhoods, just steps to Wellfleet Harbor and a lovely walk across Uncle Tim's Bridge into town. Highly recommended. We have been visiting the outer Cape in the summer for almost 30 years now. We are so grateful to have our own beautiful new home in Wellfleet to enjoy with family and friends and to rent to others to share our love of this very special place. Our home is spacious, well-equipped and very comfortable. 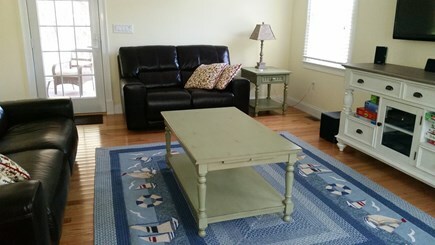 It is in a great location to enjoy all that Wellfleet has to offer. 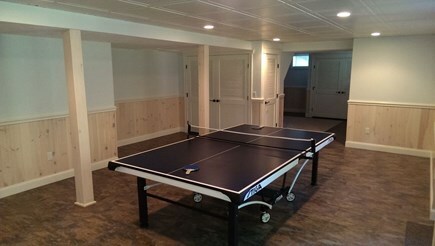 For the sports lover, we have a basketball court, a sand volleyball court, and a ping pong table. The Cape Cod National Seashore, which protects some 60% of the land in Wellfleet as well as The Audubon Society, is headquartered in this quaint and picturesque area, famous for its fresh shellfish. The 25 mile Cape Cod Rail Trail is accessible at LeCount Hollow Rd. in Wellfleet about 2 miles from the house and local bike rentals are available within walking distance from the house during the summer. We offer private access to the bay about 200 yards from the property line where you can launch your kayak or flat board for an enjoyable adventure on the water. A relaxed and peaceful 15 minute walk along the bay and over Uncle Tim's Bridge brings you into the town center to enjoy shopping, restaurants, and a local farmer's market. Also just a short drive brings you to Great Island National Park for truly enjoyable & scenic hiking and pristine beaches. 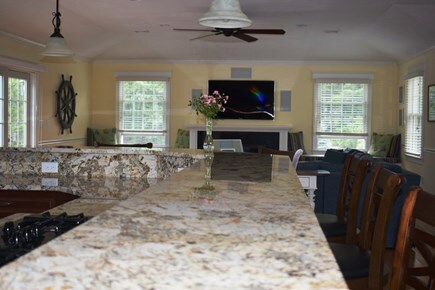 Our home offers easy access to the bay beaches (Mayo & Indian Neck) as well as Long Pond and Gull Pond and is only 2-3 miles from the Atlantic beaches. Prepare yourself for incredible beaches, sand dunes, colorful sunsets, delicious fresh seafood, hiking, biking, fishing, kayaking, and whale watching, galleries & shopping. Prepare yourself for the pleasures of Cape Cod!